*Non-U.S. residents should buy MBA Admission for Smarties from Amazon.com where international shipping is available. Launching your application process in August? Don't wait until then. Start now. Gain competitive advantage. Develop an action plan. Buy the ebook, Best Practices for MBA Admission: What you can do NOW to improve your chances next fall. Consultants! 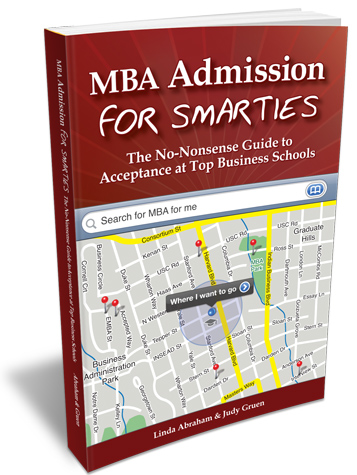 Stop slogging through the mountains of admissions books aimed at all MBA applicants. Invest in the one resource written for YOU. This ebook will teach you how to transform yourself from "just another consultant" into a distinctive, exciting MBA prospect. School focus: Harvard Business School. Finance Pros: Stop spending your time wading through the mountains of admissions books. Invest in the one resource written for YOU. The Finance Professional's Guide to MBA Admissions Success ebook will teach you how to transform yourself from a "same ol' same ol'" applicant into a distinctive, exciting prospect. Attention Techies: Are you afraid of being just another IT applicant? If so, The Techie's Guide to MBA Admissions is for you! Learn how to highlight your individuality and unique qualifications to create a distinct, exciting MBA application. MBA Letters of Recommendation that Rock shows you how to land winning letters of recommendation. Learn how to obtain stellar LORs with the practical, hands-on tips in this informative ebook. MBA I.V. 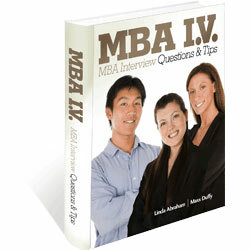 : MBA Interview Questions and Tips provides the questions that have been frequently asked during recent MBA admission interviews at the top business schools as well as the advice you need to prepare for your interview. Exactly the information you need to ace your interview -- in one instantly downloadable, practical ebook. Create a Better Sequel: How to Reapply Right to Business School teaches you how to craft a compelling reapplication and gain admission to top MBA programs. The EMBA Edge: A Guide to EMBA Admissions contains practical guidance in navigating the EMBA admissions process amidst a vibrant and changing global economy.